Champions Park is a beautiful master-planned community with convenient access to Loop 1604 and Hwy 90. The community is six miles from famous Sea World San Antonio and minutes away from Lackland and the Potranco Village Shopping Center. Medina Valley I.S.D. serves the community of Champions Park. 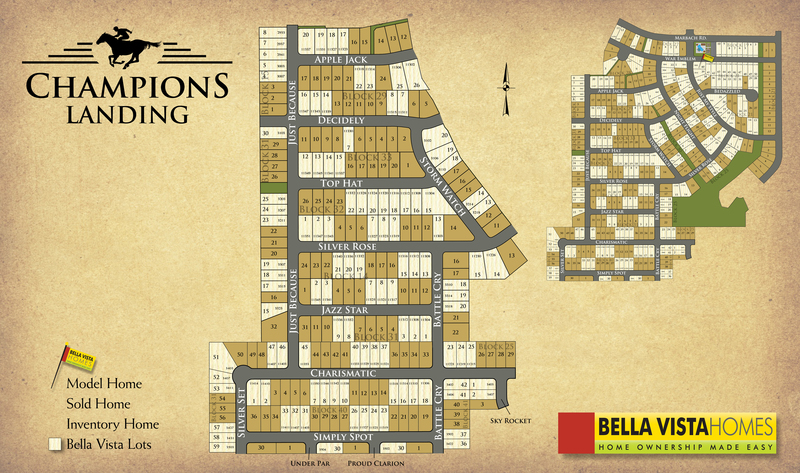 Bella Vista Homes currently offers ten spacious floorplans ranging from 1,500 sq. ft. to 3,094 sq. ft. These distinctive plans offer features such as master downs, a second floor bonus room option, a dual master option, and much more. If you have not been out to Champions Park yet, come see what we can build for you! This versatile home features an open layout with a bonus room upstairs. Any chef would love the open kitchen that includes an island facing the dining area, stainless steel appliances, pendent lights over the island, granite countertops, and a box out window in the dining area. The relaxing master suite includes a master bay window and separate tub and shower in the master bath. The upstairs bonus room has a full bathroom and a bedroom along with a gameroom area. Expect to see vinyl wood flooring in all wet areas including the family room. This home is complete with a covered back patio. This floorplan is brand new and very versatile. The main floor consists of a study, family room, and large open kitchen with a great dining room. The grand kitchen includes stainless steel appliances, upgraded tumbled stone backsplash, an upgraded Moen Arbor pull-down faucet, and an upgraded kitchen sink. The study has french doors and vinyl wood plank flooring. The master bedroom and additional bedrooms are located upstairs along with a large game room. This home offers beautiful tray ceilings in the gameroom and master bedroom. This home is complete with a covered back patio. 36”Flat Panel Legacy® cabinetry with Crown Molding, hidden hinges, and adjustable shelves. Staggered cabinets above the range. R-13 insulation in exterior walls, R-22 insulation at sloped ceiling areas and R-38 blown insulation above flat ceilings. Plus...polyurethane spray foam sealant around base plates and polyseal around doors and windows to reduce air infiltration. Built-in Pest Control System and Bora-Care wood pre-treatment to protect your home.